A lot of changes have happened for my family in the past year. The biggest change happened a little over a month ago. I quit my job and Art, Bud and I packed up the dogs and moved to Oregon. We are currently living with Art's parents, while looking for jobs and housing. Even though this was a planned move, it was still a gigantic leap of faith and has been very scary. Moving away from almost all our friends and everything we were familiar with was painful. There were lots of tears and sleepless nights. Let's face it, most change is painful. 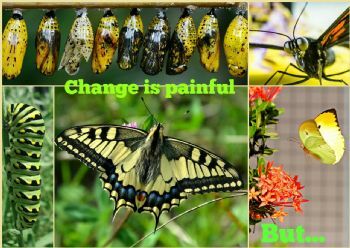 The process of metamorphosis, as shown in the photo above, can't be easy for the poor caterpillar. I'm pretty sure Dr. Jekyll didn't consider it a party when he transformed into Mr. Hyde. And what about poor Eustace Scrubb in The Voyage of the 'Dawn Treader' ? In the book, Eustace stumbles upon a huge treasure, which he decides to keep for himself. He falls asleep with a gold bracelet on his boy arm, and wakes up with the bracelet cutting off the circulation of his dragon leg? What? A dragon leg? Eustace realizes that his greed has trapped him and he begins to cry. Aslan arrives, and leads Eustace to a well, at the center of a garden. Eustace looks at the well and wants to get into the water to soothe the pain in his leg, but Aslan says he will have to be undressed first. Eustace realizes that he is a dragon and that dragons have skins like snakes which could be shed. With his new claws, Eustace begins tearing at his dragon skin. He peels off one layer only to discover another nasty, scaly, and rough layer underneath. And then another. After three layers, he realizes it’s vain — he will never make himself clean or get rid of his pain or shed the nasty skin. He allows Aslan to help him "undress." Should we avoid the pain? I don't think so. We could have stayed in Napa, but the high prices were making it more and more difficult to make ends meet. Oregon is much more affordable and I know everything will happen according to God's plan. I am so proud of you! What a wonderful adventure you are taking now. Visited Washington & Oregon last summer and I would go back in a heartbeat. Keep us posted. I pray that it all works out. Happy New Year! I know your faith will be rewarded! Wishing you much success in the coming new year! Happy New Year!??????? ?